In partnership with trainconsulting, Ennovent is conducting one-day Organisation Design workshops in December 2016 across Bangalore, Mumbai and New Delhi. 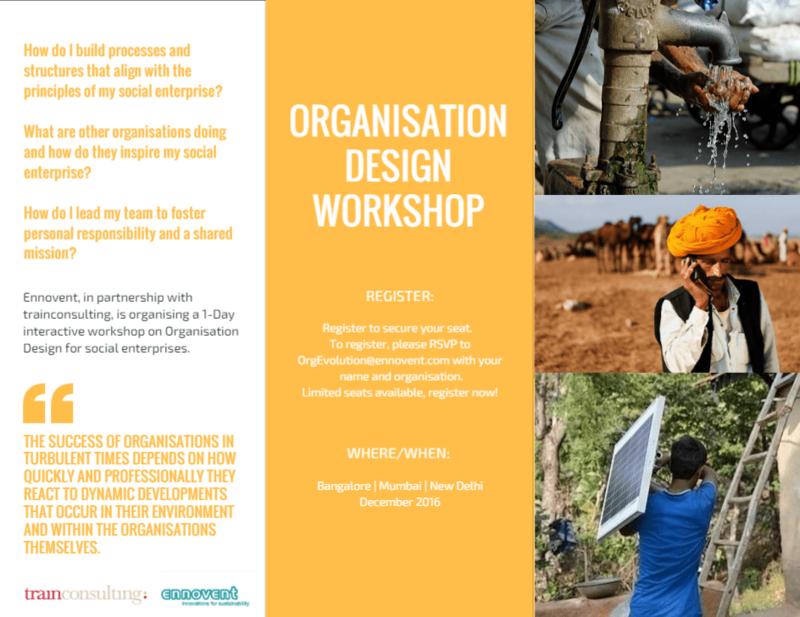 The aim of the workshop is to help social enterprises better understand organisation management and design through insights from industry leaders. Through the workshop’s intensive learning process, participants can expect to gain the knowledge, tools and skills necessary to successfully manage organisational change and build a stronger foundation for their enterprises. The workshop is free. The Organisation Design workshop is being held as part of the feasibility assessment of an innovation project – the Organisational Evolution Accelerator. This project implements new approaches to organisational systems among startups in developing countries. Through the project, startups can leverage innovative organisational systems including structures, processes and policies. The aim is to increase the effectiveness and potential of startups in creating sustainable impact in low-income communities. For more details or to register, please click here.